Need a cool unique gift for that coach in your life! Here you can personalize with team name, sport symbol, coach name, etc. These are stainless steel whistles that come with black lanyards. 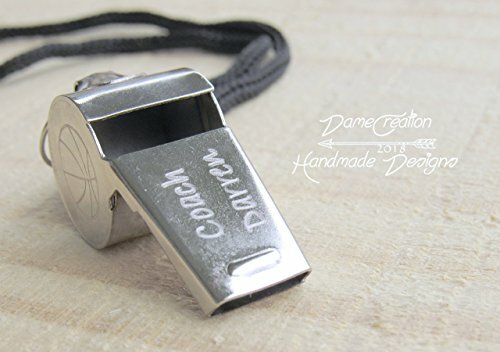 Each whistle includes a lanyard which makes it easy to carry, store, and keeps it securely in place while wearing during any activities like coaching, refereeing, or lifeguard. It's suitable for coach, referee, gym teacher, recess worker, lifeguard and etc. Also it can be used for running or walking at night, protection from dogs... It will be tool calling for help when you are in the event of an emergency. Let us help you design that custom gift! If you have any questions about this product by Dame Creation, contact us by completing and submitting the form below. If you are looking for a specif part number, please include it with your message. E-Z-Go Work Horse Custom Golf Cart Seat Cover Set Made with Marine Grade Vinyl - Staple On - Choose Your Color From Our Color Chart!